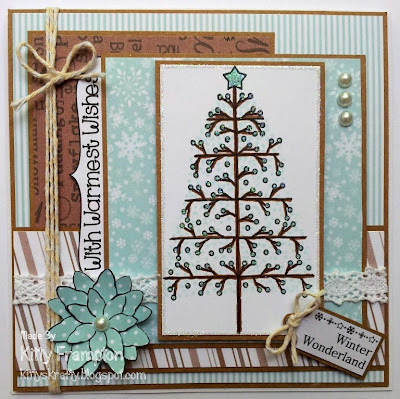 I made this card using one of the new Christmas designs called Berry Tree. I really love this stamp think it's got to be one of my fav christmas ones from all the latest releases. The papers are all from the Christmas Extravaganza CD Rom in Brown & Mint. The sentiment and tag are also from the cd. I made the flower using Flower Shapes 3 Stamp and i paper pierced it. I simply added some twine, pearls, glitter and lace! Great creation Kitty we love it , thank you.